Subtle Dementia is the latest effort from Swamp Horse, the project that consists of Josh Lay and Morgan Rankin. Recently released, this record features some choppy painted/collaged graphic design along with a sticker and a patch which is a nice addition. Two tracks on this beast, each on their respective side. Side A is my preferred track, with a neo-classical 80s horror film kind of vibe. It’s slow and plodding with glistening melodies and lurking tones. A very simple track that stays consistent throughout, yet the production and textures are really great. The subtle changes in tone keep the atmosphere consistent while adding new gestures to the piece. Side B lies much more in the experimental realm of things. Some excellent musique concrete layered samples and mixed drones form a dense bed of sound. 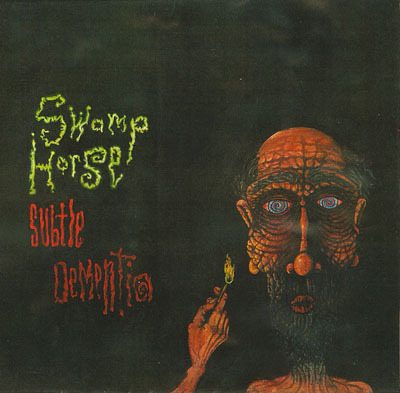 I like how different this track is from side A, it really shows Swamp Horse isn’t afraid to go out on a limb and do something different. This is a great release and recommended for any fan of Josh Lay or his activities. Probably my favorite Swamp Horse material to date.